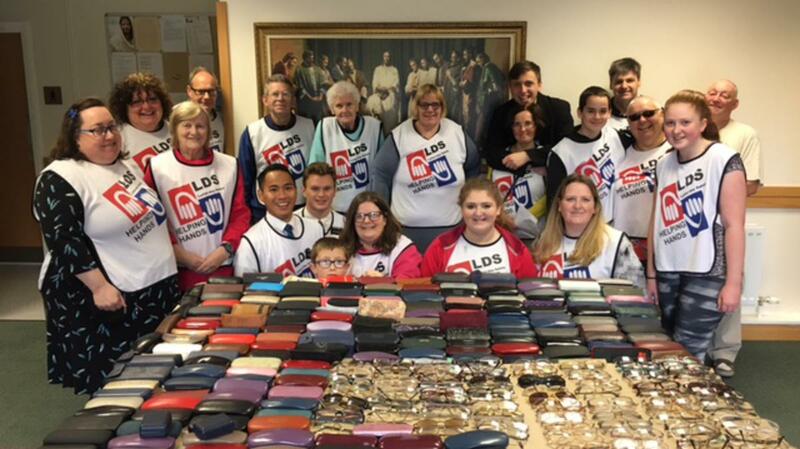 An amazing 471 pairs of used spectacles were collected in just a few hours as 32 members of the Buchan Ward, Aberdeen Stake, gave service together over two weeks. Leaflets were delivered to over 800 homes on Friday 1st September. The next Saturday ward members gathered to re-visit those homes to collect the glasses on behalf of Lions Club International. By the lunchtime break, 315 pairs had been collected. The rain stayed away until 2pm, but it didn't deter members who kept going until the last home was visited! It was particularly exciting to see the bags of spectacles being emptied on the table ready for counting. Everyone was moved by the generosity of the people in Mintlaw. There were touching stories of spouses donating their deceased husband's glasses to benefit others and stories of just how nice residents were, including driving to find someone wearing a tabard because they had missed the knock at the door, getting out of the shower to get the glasses for us, leaving spectacles in a bag at the door because they wouldn't be in and the general friendliness of all encountered. A very worthwhile outcome for a worthwhile cause.